"What you need to remember is that there's what people want to hear, there's what people want to believe, there's everything else, THEN there's the truth!" What is this movie about? I had to keep asking myself this question while suffering through not one, but two hours of The International. 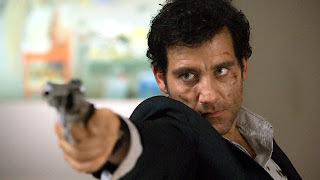 Clive Owen is a decent actor as is Naomi Watts who both star in the movie, but the plot fell flat. The two star as an Interpol agent and an assistant district attorney, respectively, who investigate the murder of an Italian politician....or something to that effect. They get caught in some hot water when the case unveils other shady activities, including money laundering, arms trading, and the destabilization of government between New York, Milan, Istanbul and Berlin. All the running around, gunfire, and dramatic music couldn't save this sinking ship that only seemed to get worse. This is a waste of talent and quite frankly of waste of time, mine and theirs. Thanks for this review Candice. I was curious about this movie but also don't like wasting my time! I always feel out of touch on your blog because I have seen such few movies. Can we get a Disney special:)? @CJ you might be waiting a long time for that one.